If you’re using a browser like Firefox or Internet Explorer where Flash Player is still an add-on… heads up! Adobe has long played games with its installer. They used to try to trick you into installing McAfee Site Adviser. 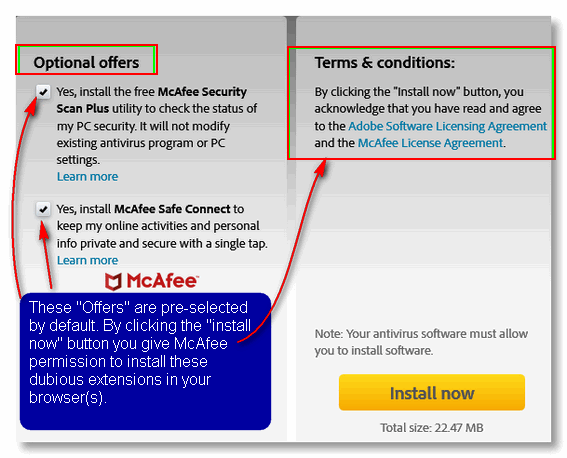 But now Adobe and McAfee have teamed up to make things even worse… with Adobe now bundling two questionable McAfee products with its Flash Player installer. It’s important that you keep Flash Player up-to-date, and it’s too bad that Adobe takes advantage of people by bundling two essentially worthless McAfee browser extensions with Adobe Flash Player. We recently became aware of this when one of our subscribers noticed he had McAfee software on his computer, but never installed any – and no McAfee software came pre-installed on his computer. So, today we did a test. Our Firefox browser showed that Adobe Flash Player was outdated and needed an update We went ahead and did the update and this is what we found. When we tried to install the Adobe Flash Player update, there were two “Optional offers” – both were pre-selected. The first pre-selected offer was “McAfee Security Plus” a useless browser extension. The second offer, even more worthless than first, is called McAfee Secure Connect – which supposedly protects your “online activities and personal info” you with a single click – which it most certainly does not. Be sure you don’t rush through the installation of this tricky “brand name” software bundler. Uncheck both boxes on under “Option offers” before you click the “Install now” button. This is a really tricky one – you must click the “Install now” button to install the software you came to get, but if you don’t uncheck those two “offers” you’re going to end up with two browser extensions you didn’t know you were getting – and most assuredly don’t need. Now you now what to look for, you should be able to avoid this software bundling attempt by two brand names you should be able to trust, but unfortunately can’t. If you’re using Chrome or Microsoft Edge you never need to download Flash Player or update it. Flash Player is included with Chrome and Edge and is updated whenever the browser is updated. I don’t have flash in Firefox at all. I will not allow it on my main browser. Chrome will be used if I need it for something. Flash will hopefully be gone in 2020, to my understanding. At least on main browsers. I don’t know about forks. We will see I guess. HTML5 will replace Flash, but I doubt Flash will be replaced everywhere by 2020. For 5 years now they’ve been saying HTML5 will replace Flash – trouble is, there are 1000’s of Web sites (particularly game sites) designed to use Flash. Some of these sites just don’t have the money (or manpower) to completely rebuild their sites to a sites based on HTML5. So it’s going to be a long, long process – unfortunately. Flash is and has always been very vulnerable to attack, that’s why Adobe continually updates it — to fix the holes that hackers keep exploiting. But as soon as they close some holes, more vulnerabilities are exposed. It’s been this way for years. Adobe has other sources of income, so they don’t have any excuse for their sneaky ways. Trying to force unwanted McAfee browser extensions on people’s computers should be above a big, well-known company like Adobe, but why should they be concerned about their customers now – apparently they never have been. Yes, Adobe has other sources of income. That does not say very much for Adobe pulling this McAfee trap. Good to let people know though. I have always heard the same thing about HTML5 will replace flash for the last so many years. I’m hoping the browsers stay on the roadmap they have created for themselves though, about flash, in the last several years. All of this is to be at the end of 2020, and yes I agree we will see. Now remember we did not bet on this or shake hands :=). The browsers need to keep Adobes feet to the fire on this. Just keep making it harder to bring up Adobe flash player. Look, when I feel good I play some flash games and I know better. I know that is not a good thing to be doing. If, and when something does happen I should not be surprised. It is not like you have not heard about Adobe flash security problems all through the years. I will miss these few flash games but the danger is so high and HTML5 is here and still growing, but I think it is the games more than anything causing the big hold-up, just my opinion. Here is a link for the roadmap for the browsers from Adobe. When you click on each browser it will tell you what they are planning to do with flash or have already started to do. This was POSTED ON 07-25-2017. I was using Startpage as the search engine. Thank you for your time…D. You are so right about that crafty McAfee. I bought a new desktop PC (HP) back in October of last year and I saw that it had McAfee “Security” (ironic) Programs pre-installed. I purchased a new laptop (Lenovo) last month with the same McAfee “Suite” already on it. I am not a big fan of Lenovo except that they had a Windows 10 laptop that came with a 1 TB Hard Drive/8 GB RAM for $299.00. I couldn’t pass it up. The first thing I did in both instances was to Uninstall (through Control Panel) the McAfee programs and load Emsisoft AntiMalware. I have been unchecking the boxes at Adobe (Flash) it seems for years now. Thank you for bringing this to light for all of us. Thanks SO much for this info! I didn’t know that Chrome already had Flash. I recently installed it, but knew about those devious methods to include unwanted additions, so was very careful and unchecked them on the install page. So – should I uninstall the Flash that I just recently installed because I use Chrome? Do not install anything without carefully going over every box and word on that install I never do and hopefully some installs don’t have stuff hidden. That would be disastrous! 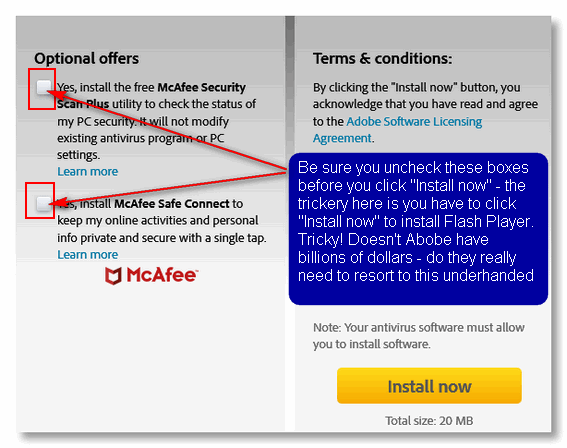 Thanks for spreading the word re: Adobe Flash, and Adobe Acrobat Reader DC includes the same ‘rogue’ McAfee. I discovered that an (un-named for fear of aggro) temp user of office suites on my computer downloaded the Acrobat PDF favourite and ‘forgot’ past UNCHECK instructions when downloading any and everything. I ‘forced’ uninstalled McAfee, not all files were removed which are lingering and snoozing in Windows Defender firewall even though Emsisoft is the prime Anti Rogue protector.